Its message -- that minimum wage increases will lead to service workers being replaced by apps -- is continued on an accompanying website -- BadIdeaCA -- which claims to be "holding activists accountable for minimum wage consequences." So who the hell pays for billboards threatening waitstaff with redundancy if they demand a living wage? A bit of digging and clicking reveals that the campaign is backed by Employment Policies Institute, the conservative lobbying group which regularly campaigns on behalf of the restaurant industry. ...Murphy has a long history of trying to convince courts that workers are not being screwed and that dominant monopoly corporations are good citizens, despite evidence to the contrary. 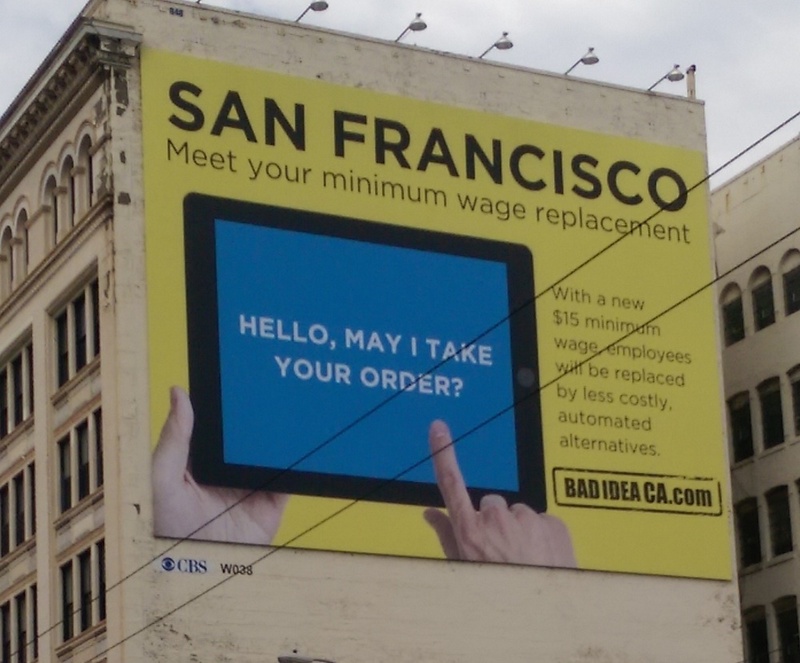 It's somehow grossly fitting that a group which argues for screwing service staff -- and which is advised by a guy who tells companies like Apple that it's ok to screw their workers -- is now posting ads in San Francisco saying that service staff deserve to be replaced by iPads if they demand a fair wage.